As you may already know, this year the fifth edition of OpenNebulaConf is taking place in Boston on June 19-20. If you are willing to attend and can save now the date you can take advantage of a 40% discount in your Conf tickets until March 31st. Thanks to everyone who has already submitted presentations for our first event in North America. Due to several requests for an extension of the deadline for the call for presentations, we will now be accepting submissions until this Wednesday, March 22nd. Today, the model of hybrid cloud comes under the eyes of a lot of organizations. The idea of combining resources of public cloud providers with private depending on the terms of execution, the need of more resources, an extra protection of the data, more or less security in services with sensitive information, etc. are some of the capabilities that this model has to answer. The case of CSUC, acting as Opennebula powered cloud provider and at the same time as user of external IaaS and PaaS services, is analyzed sharing its first experiences in the way to archive a real multicloud architecture. Figure 1- The Hybrid Cloud, acts as a slicing bridge. The majority of organizations have not been born in the “cloud”, situation that produces a lot of cases where the cloud resources have to interact or to be connected to traditional systems and applications with some criticality and usually are situated in its own dependencies. This kind of architecture is the most usual, where the main keys for its success go through to be aware about things like the integration capabilities or the impact in the organization roles where could exist different interpretation of the same concept. For a solutions designer the model has to offer flexibility, speed and capacity. In the case of the infrastructure team it’s easy to think that more “different things” have to be managed. The business development staff will ask if it will be more expensive and which is the value that the hybrid model will contribute. From the IT infrastructure perspective, when a public cloud provider is selected/procured, a good approach to start with in the adoption of hybrid cloud model is to focus in these first three challenges. Networking: to extend your network layers with capable “dedicated” circuits provision with bandwidth control outside and inside public cloud provider(s). Management: to consolidate a truly global infrastructure management platform through a cloud orchestrator and its cloud bursting capabilities. Security: to extend to public cloud provider current security layers (platforms, tools, policies,…) under the current organizations umbrella. Definitely, the model or architecture to implement will be different depending on each case where the applications/services have a lot to say and have to be listened. The pure reality is that nowadays almost all the organizations work in two different speeds and this is something that the technology departments have to work with. Some very changing environments like web and mobile applications and other more robust systems associated to critical processes with high levels of stability and security. A real cloud hybrid model should support the combination of this two speed ecosystems maintaining its specific dependences and needs. CSUC, in these last two years has worked in these challenges with some actions that are transforming roles, the management models at ICT infrastructure level, the way of services provision, etc. The first action was to start a procurement process to provision the first IaaS provider with the idea of infrastructure and services optimization in a new model of payment by use. In parallel as RREN, the adoption of a orchestrator role with its own cloud management platform (Opennebula based) to manage distributed resources in a real multicloud environment. The network design, the unified management and security conditioned the strategy. Regarding the new external cloud provider and after an a intense procurement process, the company Nexica resulted adjudicator for four years of the provision of IaaS services for Catalan Universities and CSUC. First IaaS provider procurement process. Service catalog, service-level agreements and governance. RREN extended to the provider: Layers 2&3. Integration of CSUC opencloud orchestrator. Deployment of first production services. If you are interested to see more details, please contact with us. This initiative will be presented in the next TNC17 , the annual Géant congress, at Linz – Austria [31/5/2017] (see the full paper here). This little post is here only to thank the people from CESNET for organizing the event. I also want to thank the attendees for sharing the day with me. The tutorial now is done in prepared laboratories in the cloud. This helped a lot for people with Windows or 32 bit laptops. Instead of talks after the lunch there was a demonstration of OpenNebula and vCenter and a session of QA where the attendees could ask for specific features or how to accomplish some workflows. We are excited to announce that Jack Wadden of Akamai Technologies, and James Cuff and Justin Riley of FAS Research Computing at Harvard University will be keynote speakers at the Fifth OpenNebula Cloud Conference, the must-attend open cloud event, that will take place on June 19-20 in Cambridge, Massachusetts. More speakers will be announced shortly and a preliminary program will be ready by the end of March. This is the first edition of this open cloud conference in the United States. The call for presentations is open through March 17 and the very early bird registration is available through March 20. OpenNebula Conferences are vendor-neutral events focused on real-world practices and how to successfully implement open source in your cloud. They are education events that serve as a meeting point of cloud users, developers, administrators, integrators and researchers, featuring talks with real user experiences and use cases. They also include hands-on tutorials, lightning talks, and hacking sessions that provide an opportunity to discuss burning ideas, and meet face to face to discuss development. Previous speakers include Santander Bank, CentOS, European Space Agency, FermiLab, Puppet, Red Hat, BlackBerry, Telefonica,,Runtastic, Unity3D and Citrix. Be up to date with this monthly newsletter of the OpenNebula project with the latest advances in in the technology, community work and the dissemination efforts carried out in the project this past month. As you may know, the first ever US edition of the OpenNebulaConf will take place on June 19-20 in Cambridge, Massachusetts. The final keynote lineup will be announced shortly. The call for presentations is open through March 17 and the very early bird registration is available through March 20. Our first release of the software was 9 years ago. Find our vision of these past years in this post. OpenNebula 5.4 is approaching fast its first beta release. The vCenter driver is undergoing a major refactoring, and the storage and networking aspects, as well as import mechanism are getting a whole pack of new functionality. Other important functionality that will make it into 5.4 is: linked clones, vSphere 6.5 support, public and private marketplaces, new cache mechanism that means performance enhancements, and much more! But not only vCenter is getting its share. More general functionality is also in the works, with exciting new possibilities like defining VM Groups to implement affinity and anti affinity rules for VM deployment. This enables multiple use cases in which the colocation (or not) of VMs between them or with particular hosts is relevant. This added to the improvement in permissions definition -giving more flexibility to who can execute what-, enhanced history logging, image persistency selection, general Sunstone improvements and many more means that 5.4 is going to be special release indeed, which we believe will bring much joy to cloud admins and users alike. Saying that the OpenNebula community excels is an understatement. The ecosystem keeps getting richer thanks to amazing contributions such as this one. LXDoNe is an active project based on an add-on that allows OpenNebula to manage LXD containers. It contains a virtualization and monitoring drivers, and it feature life cycle control: deploy, shutdown, restart, reset, suspend and resume containers. Also, we want to salute our friends at NodeWeavers with their brand new 11 release. 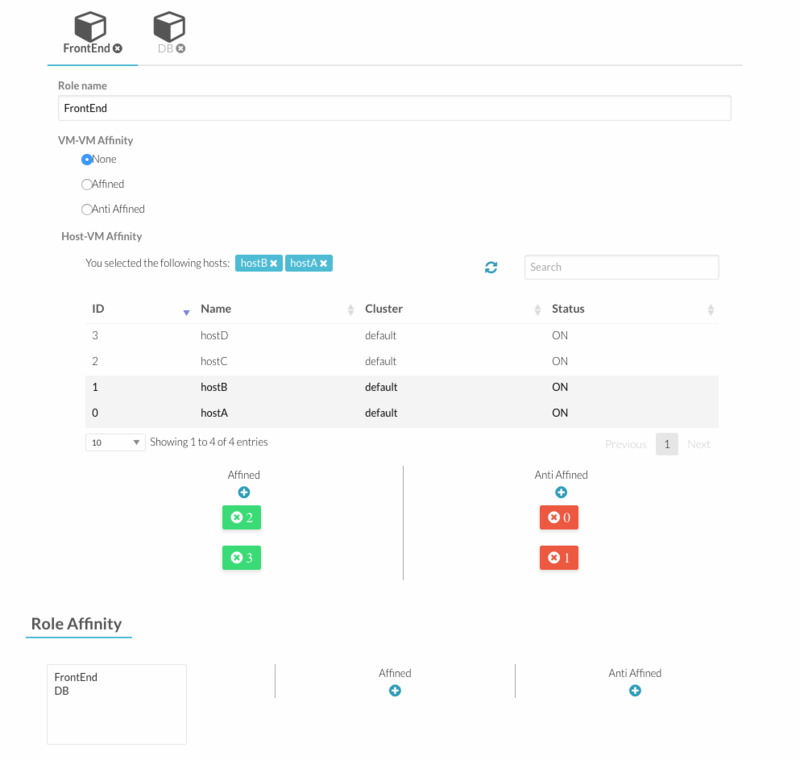 Also nice to note that OpenNebula is now featured in siftery! The first release of OpenNebula was 9 years ago!. We are very proud of the path we walked these past 9 years, and are very happy of all the use cases OpenNebula has powered so far. Nine years ago, in February 2008, OpenNebula announced the first open-source management software for deploying private and hybrid clouds, and released one of the most transformative platforms for innovation in the cloud. The first US edition of the OpenNebulaConf is happening this 2017, as one of two OpenNebulaConf editions this year, one in US and the other in Europe. The US edition will take place on June 19-20 in Cambridge, Massachusetts, and the european edition will be held in Madrid, Spain, on October 23-24. If you are wondering what the OpenNebulaConf looks like, check the post with the material of 2016 OpenNebulaConf. The call for presentations for the US edition is open through March 17 and the very early bird registration is available through March 20. The OpenNebula Cloud TechDays are events designed to learn about OpenNebula with a hands-on workshop on cloud installation and operation, and presentations from community members and users. From the list of TechDays for 2017, the first one is happening this year in Prague this 7th of March. Other TechDays happening this year are: Nuremberg, Madrid, Sofia, Barcelona, ,Vancouver, San Francisco, Ede, Hluboka, New York and Almendralejo. Are you looking to get into the cloud professionally? If you are looking to work in an agile environment to develop new features and integrations and participate in the upstream community, this is your chance. Check out the OpenNebula Systems vacancies if this is the case, we are currently interested in a Community Specialist.